Finding the best flight: If you have not discovered the online flight matrix site we highly suggest it. If you find a fare you like, you can give the flight information to the airline when booking. We highly suggest scheduling a flight that arrives in San Jose CR before or around noon time, as you will have a beautiful 3 hour drive ahead of you and nice to get settled before sunset at 5:30. For late arrival flights or early morning departures, here are a few suggested convenient hotels near the airport that provide free shuttle service to the airport: Holiday Inn Express, Hampton Inn and Mango Hotel. If you'd like to save a bit, you can find a place near the airport or along the way on airbnb, there are plenty. Fly (to Quepos): There are no domestic flights to Dominical Costa Rica; but you can get close by plane. 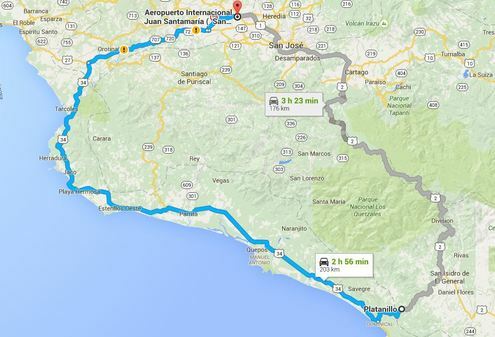 The airport of Quepos (Managua Airport, XQP) is just 30 minutes away from Dominical (our area). Both Sansa and NatureAir have several daily flights from San Jose and take only 20 to 25 minutes. A round-trip ticket is usually under $150 USD per person. The taxi from Quepos airport to Dominical will be around $55 USD, cars can be rented in Quepos as well as taking a bus. Sansa also flies into San Isidro. Rental Car: The best way to travel in Costa Rica as you'll have the freedom to go wherever and whenever you want, get groceries or go on daily expeditions. The roads in Costa Rica are quite good, but getting to some remote areas it is better to rent a 4x4 because traveling unpaved roads can get muddy and slippery after a rain. The roads from San Jose to Dominical are excellent! It will take you about 3 hours. We suggest Solid Car Rental or Hertz they are across from the airport and provide free shuttle. I have heard good things about Vamos but have yet to try them. This informative article from Vamos is about the insurance requirements in Costa Rica. Hertz, Solid and National also have locations in Quepos and Uvita which can be beneficial if assistance is needed. Rental Car Map for San Jose areas. NOTE:​ GPS is advised: WAZE is a free GPS app and includes way more streets/roads for Costa Rica then Google. NavSat has mapped out nearly every road in the country, plus restaurants, hotels, etc. You can pay for various lengths for use, 10 days ($49), 30 days ($69). Corazon del Rio, Platanillo, Costa Rica can be found on Google maps if you purchase a Costa Rica SIM card. This can be done at the airport near the baggage carousel at the "Kolbi" desk. For more info on cell phones in Costa Rica click here. Taxi to Dominical: A comfortable and relaxed way to travel to Dominical is going by private taxi. You will love the 3-hour ride. Cost can range from $100 to $150 USD one way. If by taxi, you can get a ride up the hill from Dominical to Platanillo. Shared Shuttle Service to Dominical: A cheaper alternative – when traveling with less than 4 people – is going by shared shuttle services (like MonkeyRidecr.com, SuperShuttlecr.com). This will take a little longer since it will pick-up and drop-off people along the way. If the minivan gets full, it can get quiet tight and less comfortable. The trip from San Jose to Dominical via shared shuttle will be around $55 USD per person and about 4 hours. Public Transportation to Dominical: There is no boarding buses at the San Jose Airport. You will need to take a taxi to the Plaza Viquez bus station in downtown San Jose, buses leave to and from Quepos, several times a day. Tickets are about $8 USD per person one-way. This is the most time consuming of the options. It will take around 5 hours to get to Dominical from San Jose by bus. The buses are in very good shape and because they are usually not that full, it is also quite comfortable. ​If you plan on using the public buses to travel around the country, download the app Off the Grid Traveler. It is free and in English! This app basically tells you exactly which buses to take and when they depart for anywhere you would like to travel in the country. Overnight Stay in San Jose: For late arrival flights or early morning departures, here are a few suggested convenient hotels near the airport that provide free shuttle service to the airport: Holiday Inn Express, Hampton Inn and Mango Hotel. From the Airport (SJO) drive west on Highway #1 for 7.5 km to Coyol exit and take overpass onto Route #721 south to Highway #27 a toll highway that accepts dollars or colones. Head west to Orotina. Just after Orotina's toll booth, exit onto coastal Highway #34 towards Jaco. ​Head South past Jaco, past Hermosa, past Parrita, and when you get to Quepos veer left and follow signs for Dominical, passing a MaxiPali on the left (with a green roof). Maxi Pali is owned by Wal-Mart, and a good place to stock up on food and other supplies for your stay. Do not go straight into Quepos unless you want to check it out, follow signs to Dominical for about 45 minutes continuing on hwy 34 South, past Savegre, past Parrita, past Matapalo, past Hatillo, and once you pass a large gas station after Playa Guapil on the right you are getting close. You will come to an intersection with a police check point just before the Dominical bridge. Turn left uphill on Route 243 just before the police check point. This paved road leads up to Platanillo < Click for MAP and PHOTO of turn off to our road. In Platanillo there is a walking bridge over the road, from it you are only 100 meters away to the road to Corazon del Rio. After the one bend after the walking bridge take a quick right turn off the paved road onto La Carretera Ceiba, drive 1.7 km to our location. 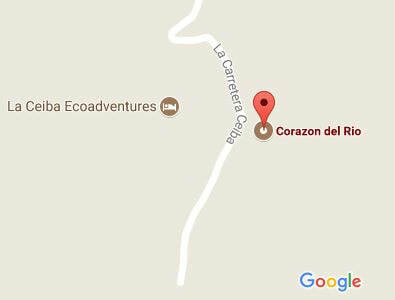 Casa Corazon del Rio is located just 100 meters (south) from our neighbor: La Ceiba EcoAdventures who you will pass on your right. ~LOST~ CONTACT US, AND WE WILL HELP GUIDE YOU, SAFE TRAVELS!!! Oh, and as you may find out, most honks, are friendly warning honks in Costa Rica. Oh. Oh, the police tend to always drive with their lights flashing, so don't freak out. ​the middle photo above is the turn to take that will bring you to 1.5 km (1 mile) to Casa Corazon del Rio, drive slow.